Recently various organizations and governmental groups have been working to get the Shikoku pilgrimage route recognized as a World Heritage Site. However, to do so it is necessary to prove to UNESCO that the sacred sites and paths leading to them have outstanding universal importance. While the pilgrimage route might have been significant to people hundreds of years ago, a lot has disappeared with modernization or is in a state of disarray. Thus, one strategy is to find and reestablish original sections of the route. One example is a short section by Temple 20, Kakurin-ji (鶴林寺) and another by Temple 21, Tairyūji (太龍寺), which are now designated national historical sites (国指定史跡). 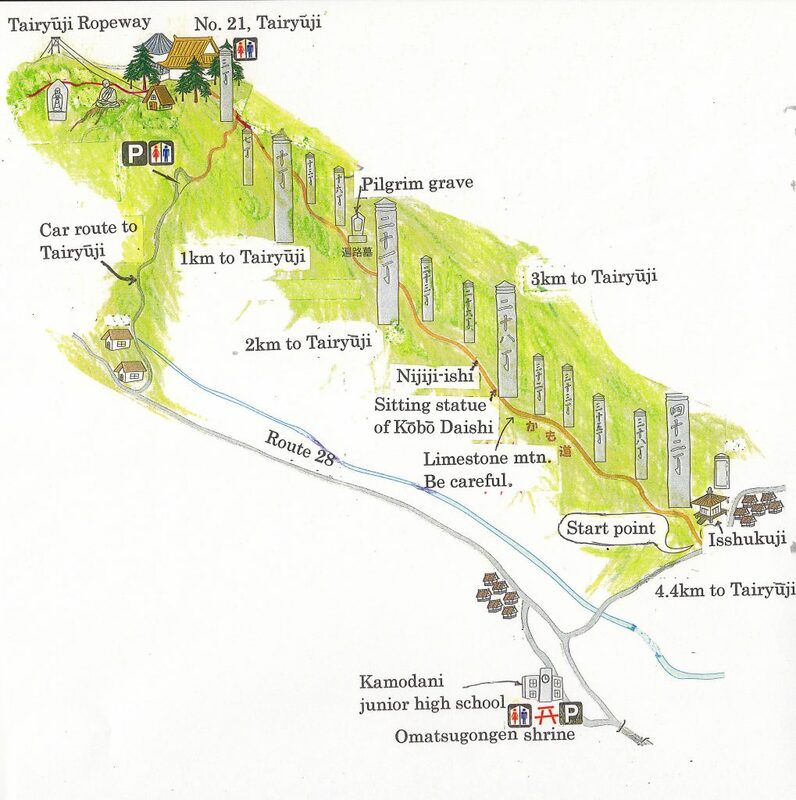 The Kamo-michi (かも道) is a recently restored and reopened 4.4 km portion of the Shikoku pilgrimage route which leads to Tairyūji from a direction other than the usually travelled route from Kakurinji. There are references to the Kamo-michi in maps and guidebooks from the 17th century, so its history is long, but it fell into disuse for many generations. This temple, which was built on the spot where Kōbō Daishi spent a night, is the start of the route. There are six stone markers here, which are believed to have been along the path, but at some time were pulled up and collected here. 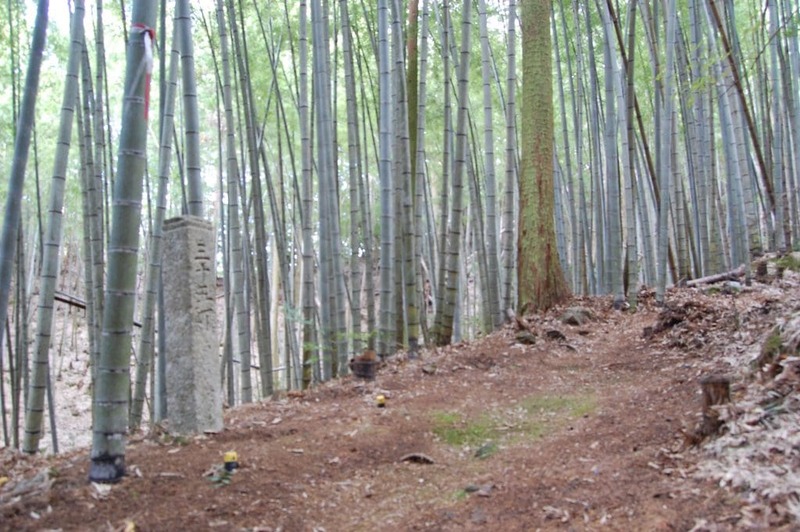 These markers, which are called choishi (丁 or 町, 石）[cho means 109 meters and ishi means stone], were placed along the route every 109 meters and have numbers etched on them. No. 41 is at Isshukuji and No. 3 is at the temple gate of Tairyūji. Unfortunately, however, of the original forty-one markers only twenty have been confirmed. No. 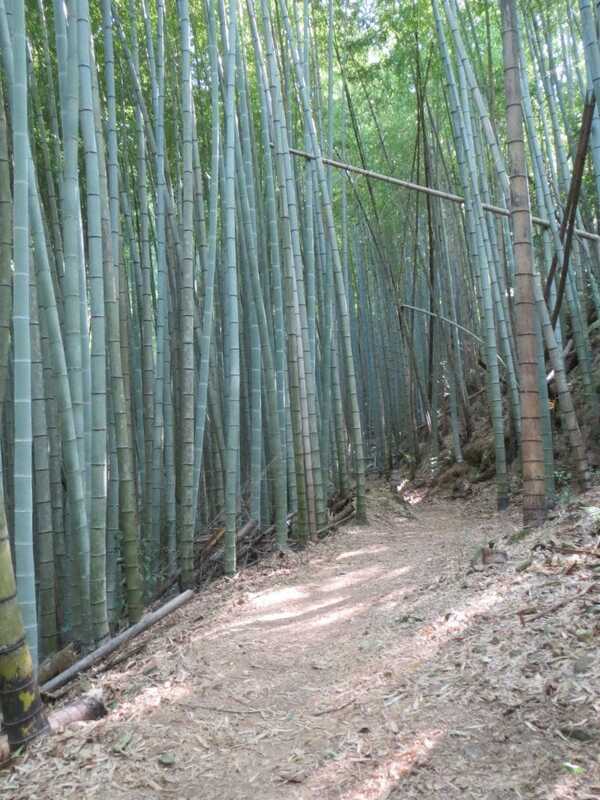 33 is significant because it was placed there in 1365, earlier than any other path marker in Shikoku. On the 32nd marker is etched,“ 右 かも ”(migi, kamo), which told pilgrims to take the right fork in the road. This is the first evidence of this route being called kamo. The 10th marker is unique because the two lines at the top are a simplified version of a gorinto ( 五輪塔 : a kind of stupa composed of five different shapes of stones stacked atop one another, which represents the five universal elements of earth, water, fire, wind and sky). According to an old document these stone shrines were built in 1864. Originally, there were thirty-three of them each with a statue of Kannon inside; however, because this path was not maintained until recently the statues were moved to the grounds of Isshukuji. There should be thirty-three ishimuro, but presently only twenty-two have been confirmed with most of them in a collapsed state. This statue near the 28th marker is said to have been built in 1805. On the left side is an inscription that states that Kōbō Daishi jumped from this spot to Temple 20, Kakurin-ji. In fact, you can see an indented spot in the rock platform where Kōbō Daishi thrust his staff to make this super-leap across the valley. It is believed that when Kōbō Daishi was travelling along this path, this huge rock fell towards him, but by putting up his left fist he was able to stop the rock. You can see an indentation where he grasped the rock. 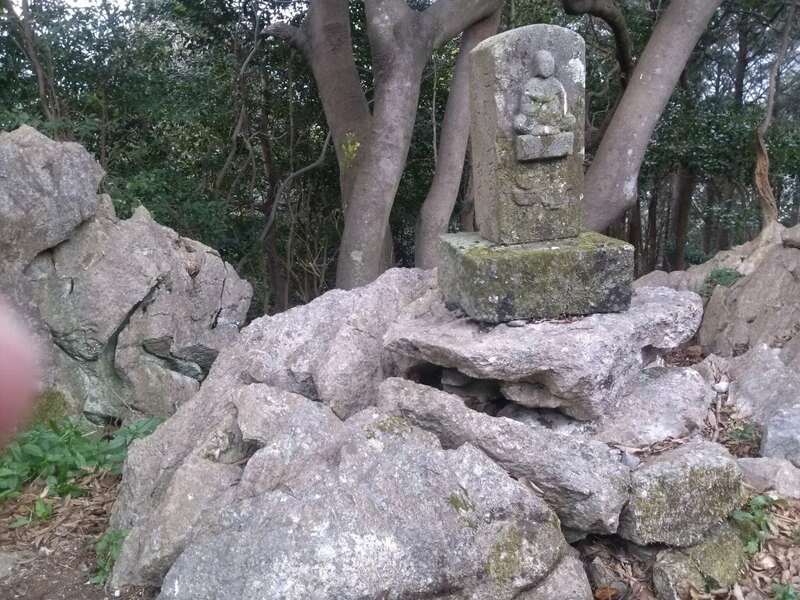 Near the 26th path marker is a large rock, which is believed to have been close to Isshukuji, but is slowly moving towards Tairyūji and when it does reach the temple the world will sink into a sea-like swamp. The local people have done a great job in restoring the Kamo-michi and I highly recommend experiencing this historically and culturally rich, mountainous route. It will only take a couple of hours to reach Tairyūji and when you do you can take the ropeway (cable car) down from Tairyūji or head back down the Kamo-michi to Isshukuji to head back to Tokushima. Go by car and park at a shrine called Omatsugongen（大松権現）next to Kamodani Junior High School（加茂谷中学校）or take a train to Anan station and then a bus going west headed for Omatsugongen bus stop. The bus will take about 40min and cost 490 yen. Walk from there to Isshukuji, but make sure you have food and drink because there are not any stores in this area. It is also possible to walk there by walking down the road from the closed Oi elementary school to Isshukuji. This article was first published in the November 2014 issue of Awa Life.